- There is a lack of uniformity. - The rules are confusing. - Filings are refused for the looniest reasons. - The time lag in response for acceptance or rejection is unacceptable. - The time lag creates venue conflicts. - The lack of predictability injures attorneys' reputations. These and other failings of the new efiling system have numerous short-term or "efficient" causes, but they all stem from two major blunders: the system is mandatory and the system is improperly aimed at electronic filing rather than electronic storage. Electronic filing started in 2000 with Texas Online, a system originally run by Bearing Point (an information management off-shoot of KPMG) through an agreement with the Texas Department of Information Resources (the "DIR"). Bearing Point declared bankruptcy in 2009 and the contract was picked up by NIC-USA, a company that, like the current provider, caters to government bureaucracies. The original Texas Online system went live in Fort Bend in 2003 and incrementally expanded until 2012. In 2011 NIC notified DIR that it would not renew the contract in 2012. Texas Online had its issues, but over the course of the intervening time, it was molded into a reasonably adept portal for electronic court filing. Much more importantly it facilitated or impelled some counties to integrate the e-filing system with the significantly more important function of digital storage and retrieval of court documents. For example, Dallas County had almost fully migrated to full digital storage and management by 2008 and by 2010, public access to full document views was available online. Counties that did efiling implemented a variety of document storage systems, some of which were very robust and according to their curators superior to the current system. Other counties are not that efficient; some charge a subscription fee for "public access." The Texas Online system worked reasonably well because it was voluntary to the filer, flexible and adaptable to changing circumstances and grew as the county systems that used it for filing, adapted it to the larger and significantly more important goal of digital storage and had the flexibility and developing expertise to seek the best document management systems. It catered to the legitimate convenience of litigants and the legal community for speed and efficiency in filing. That which worked, worked well. That which didn't work could be ignored, finessed or fixed. Most importantly, the point of the initial system was not lost in some grandiosity. It was for convenience in filing, not the reshaping of filing into a fragile, "mandatory" system. That's all changed now. The Supreme Court's stated goal is to promote "the efficient and uniform administration of justice. In the 21st century, we no longer can rely on an 18th or 19th century vision for our systems. E-filing will revolutionize our courts for the better." This flowery language cannot mask the lack of sophisticated and appropriately targeted thought which failed to make its way into the new "efileTexas.gov" system. The loss of coherence and efficiency is evident. E-filing will not revolutionize the courts, but digital storage will and should make them more efficient and available. The emphasis should always have been on digital storage and management. The concentration on efiling -- that is, the methodologies of sending a document to a clerk -- is obviously secondary and a blunder. Moreover, the stated goal is internally contradictory because not all litigants will be required to e-file even in the initial set of large counties, thus sustaining what the Supreme Court claims is unsustainable. The loss of focus on a legitimate purpose has had a predictably bureaucratic outcome. With the loss of the DIR-NIC contract, the Supreme Court sent the issue to its Office of Court Administration instead of the experienced and at least technically competent DIR. The OCA issued an RFP and an outfit named "Tyler Technologies, Inc." got the bid. Tyler is another entity which caters to government bureaucracies -- which Tyler calls by the euphemism "the public sector." (Your biases about an entity that caters to a euphemism for "bureaucracy" may or may not be confirmed by the lack of consistency, completeness or coherence in the current implementation.) It's trademarked document management system is apparently now mandated, though at least one prominent District Clerk has clearly and publicly labeled his former product as "superior." Among the minor ironies of this mandate are: first, a late amendment to the OCA-Tyler contract, by which Tyler indemnifies the courts as well as the OCA (but not lawyers) against any copyright infringement which may occur or have occurred. 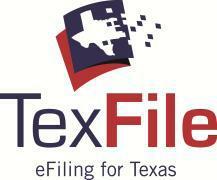 Second, note that the original name for the new system had to be changed from "TexFile" to "efileTexas.gov" because of a trademark infringement claim. Third, the apparently-now-abandoned graphic logo for the original TexFile shows the State flaking off. What is neither ironic or funny is the compensation scheme. Tyler gets paid by the transaction, of course, a toll on litigation transactions, though the contract by a late amendment caps the toll at just over $72,000,000. Tyler, the OCA and now the Supreme Court brag that Tyler has set up similar systems in 10 other states. However, one who worked inside the process admits it is simply a poor adaptation of something originally implemented in the midwest. Think of what the $72,000,000 might have bought, had the Court not been so cavalier about using lawyers as beta testers. On April 13, 2012 your State Bar Board accepted and referred to the Supreme Court a report called "Solutions 2012." The task force preparing the report started work after and in response to the Supreme Court's refusal of the Board's recommendation not to implement its "uniform forms" initiative. Read the Solutions Report; it is significantly broader in scope than the issue of the forms. This issue started when the Access to Justice Commission, an organization funded by your dues, proposed this idea to the Supreme Court. In March 2011, the Supreme Court ordered a Task Force to, among other things, develop forms and an implementation plan. While the Order says the Task Force is supposed to "represent" lawyers, judges, clerks and librarians, the "Stakeholders" in the process are defined to be the "Texas Access to Justice Commission, the Texas Access to Justice Foundation, and legal services providers" -- not lawyers. In July 2011 the Commission proposed a seven-point plan having broad impact on the practice of law. The Family Law Section, the Family Law Foundation and the GPSolo Council (which presented its resolution to the Board in January), along with numerous thoughtful bar groups and individual lawyers have voiced their strong opposition to the forms initiative, activities of the Commission in connection with the Forms Project and the Commission's and Task Force's lack of responsiveness to the Family Law Section and other elements of the Bar and the recommendation for a long, long overdue review of the Commission's budget by the Bar. Concerning the last issue, the budget of the Commission as funded by the State Bar tops $644,000.